The Grand Canyon is a popular destination for locals and tourists from around the world, for good and obvious reasons. It's one of the seven natural wonders of the world, and from a biased local opinion, the most impressive. Hundreds of thousands of visitors flock to this sprawling canyon every year to hike, ride horses or camp. And while these activities certainly deliver epic memories, one of the best ways to experience this magical place is to catch a sunrise over the South Rim. It's a memory that will last a lifetime. Over the course of an hour, the sun creeps from behind the mountains, gradually illuminating the huge canyon in a breathtaking display that gets better every minute. The extreme contours of the earth catch the light in ever-changing ways, as the air finally warms to a comfortable temperature. 1. Stay up all night with friends. This approach is easiest in the summer months, near the solstice. Two to three hours before sunrise. Bundle up in warm clothes and blankets and pile into cars, and don't forget the hot chocolate! A sturdy jacket and hat are recommended; it's surprisingly cold and incredibly windy in the pre-dawn hours, even in the summer. 2. Tell the rangers you're there for a sunrise. The gate is open 24 hours a day, but in the early morning the gate is often unattended. Sometimes the rangers will be accommodating if a group is only in the park for sunrise. Otherwise, the fee is $20 per car. 3. Go to Yaki Point to avoid the crowds. To access, park at the Visitor's Center and walk past Mather Point to Yavapai Point, or turn right on Rim Road before you get to the Visitor's Center, park along the road, and walk the half mile to Yaki. Yaki Point is usually the least crowded on any given day, while Mather Point is usually incredibly crowded with early-bird campers. Alternately, walk along the Rim Trail and find a nice spot to perch; there's no shortage of gorgeous views. 4. Embrace the other well-informed early-rising campers. While Yaki Point is less populated than anywhere else, and much quieter, don't count on being alone. Even when some locals do congregate, usually in the nicest weather, the anticipation lends a quietly congenial atmosphere, as everyone huddles against the wind together, and anxiously awaits the first rays of the morning sun. Sharing hot chocolate with strangers just seems like the right thing to do. As the Reuters Travel Picks says, “The most impressive sunrises in the continental United States occur every day across the Grand Canyon. Cool purples melt into shades bronze and orange against the awe-inspiring scenery, arguably America's greatest natural wonder.” Take lots of pictures, but don't spend the whole time looking through a lens. Even the best camera can't truly capture a Grand Canyon sunrise. 6. Go about your day with a new found appreciation. Once the sun has truly risen (wait for it; just when it seems like the show is over, there's a last-minute moment of glory), spend the day hiking, if the fee has been paid, or go for breakfast back in Flagstaff, or even further to Williams for some great diner food. 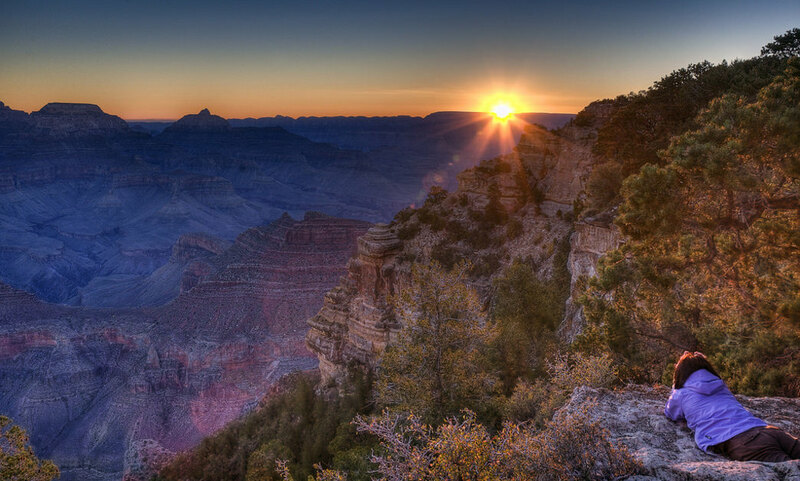 However you celebrate a sunrise at the Grand Canyon, it's sure to be an epic and unforgettable experience.